Saudi’s King Abdullah prays close to the tomb of Prophet Mohammad during his visit to the Mosque of Prophet Mohammed in Madinah July 12, 2009. 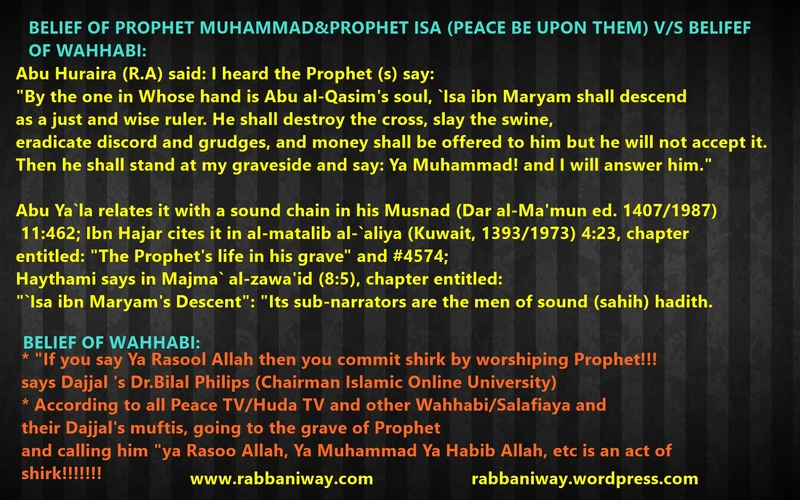 Answering Wahhabism:Isthighasa from Grave&Calling Up on The Pious In The Grave is Not Shirk Not Bid’ah!!! Wahhabis saying:those in the grave do not hear or respond! and it is shirk to speak to those in the grave, But It is Sunnah to give salam to those in the grave!, So isn’t it Wajib (Obligatory) to respond to salam?. – Why I am following those who call Muslims as grave worshipers,mushrik and kafir? -Why I am followoing those who spread hatred division and fitnah among Muslims? – Why I am following the deviants and liars? -Why I am following those who slander Muslims accusing them Shirk and Kufr? So the Purpose of greeting Salam to the people of the grave is for their Benefit, So according to the conditions to benefit from Salam, salam must be responded!. Because if the Salam is to the benefit of the only living person, then he can benefit from the living brothers and sisters near him, by giving salams to them. We can see that there is a mutual benefit for the dead and alive by visiting grave and greeting them, and they will reply to our salams, as it is wajib and Prophetic command to reply to Salam! Allah Inspires us with such small example to refute this false sects: called Wahhabi/Ahle Hadith/Muwahid/Salafi etc! Fatima (‘a), daughter of the Holy Prophet (s), used to visit every Friday the grave of her uncle Hamza and recite prayer (salat) and cry sadly at his grave. Here we must ask some questions to our self! Allah did not know how much Muslims can pray a day? Allah Subhana Wa Ta’ala teaching us about importance of Waseela and Istighasa from pious ones through this act of Prophet (S.a.w) repeatedly coming and going between Allah and Prophet Musa (A.S)! So we see that not only ordinary Muslims like us should make Isthighasa/Waseela but it is even made necessary for His Prophets to seek waseela/istigasa between them! Only those who are fooled by Shaitan, will say Isthighasa and Waseela is shirk and Bidah! We are living in a world of uncertainty and misconceptions. Man is beginning to question the very roots of his beliefs for Allah Almighty and the Holy Prophet Sall Allahu alaihi wa Aalihi wa Sallim, to create doubt in the minds of the simple and unsuspecting Muslims. Quran 17:81 And say: Truth hath come and falsehood hath vanished away. Lo! falsehood is ever bound to vanish. Sura Al-Kahf:Verse-21-Thus did WE make their case known to the people,that they might know that the promise of Allah is True, and that there can be no doubt about the Hour of Judgement,Behold they dispute among themselves as to their affairs. Someone (Said),”Construct a building over them”:Their Lord knows best about them:Those who prevailed over their affairs said, “Let us surely build a place of worship over them”. This is the translation from Abdullah Yusuf Ali’s Quran Tafsir. This is a clear evidence and and a proof against your claim.Allah want to make the case of pious and righteous known to the world. And Allah saying in next line those who prevailed best in their affairs (those who acted the best) said to build a Mosque over their Grave. And it is a waste of time and irrelevant and Prohibited you and me going to make Mosque on our or our relatives grave. What you said above is applicable to you and to me. Insha Allah you will have some witness . Wahhabism the Origin of Terrorism and Mass Killing of Innocent Muslims, The Only sect that call Muslims as Kafir Grave worshipers and Mushrik, no big fitnah came in this last era, bigger than Wahhabism, the greatest fitnah will be Fitnah of Dajjal, followed by this Fitnah! Another proof that the people which Prophet referring is none but Wahhabis.As Wahhabis emerged in the last part of Hijra calender,now Hijra 1433, they emerged somewhat 1300 Hijra. In Fact,Wahhabis were the last sect emerged in Islam, after them you will not see any sect emerged in Islam and cause much deviance in Muslim world than that of Wahhabis did. “They will be our own people and speak our language!,desptie being Arabs and Arabic speakers, the quran verse (the wisdom of Quran) would not go beyond their throat! The people Prophet (s.a.w) warned us, who will come in the end of times, very close to the time when there will no Imam of the Muslims! But we see from the words of Prophet (s.a.w) that says to stick with the main body of Muslims (who were Hanafi and Sufi creed) when the fitna arise in Muslim world in 1800s, then after that Prophet (s.a.w) commanding Hudayfa R.A to isolate from all the fitnah wahhabi sects and groups! As we see, the main body of Muslims and their Imams have expelled from Arabia and Arabia became Saudi Arabia and Wahhabism became it’s sponsored official religion ,Prophet (s.a.w) advise Hudayfa (R.A) to stay away from all this groups and isolate until he meet his LORD! So follow the Greater Majority of Muslims and their Imams!, not those who say: we do not follow Imams, yet preach about Imam Mahdi (A.S)! The deviance of salafis is clear from this hadiths! The Khalifas of (Imams of Muslims) were Hanafis, Abbasids and Ottomans (700 years Khilafat) were Hanafis. Hanafi Madhab is the Madhab salafis hate most in this days! Fight against your ego to leave Wahhabism, that is the true Jihad for you!